This weekend I will be conducting a one-day workshop on weight loss. The focus, rather than being on a specific weight loss method, will be on the mindset necessary to not only lose weight, but to keep it off. 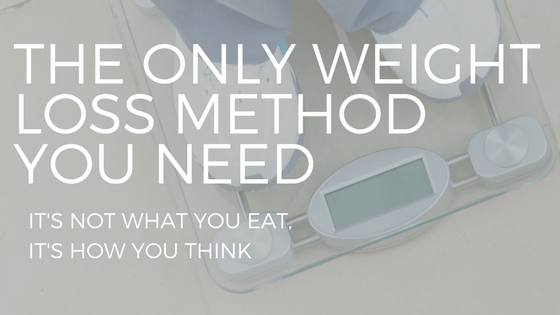 Many of my clients have spoken of the years of struggling with their weight. They’ve shared the near-indescribable feelings of joy and accomplishment that come with stepping on a scale and seeing their goal weight reflected back at them. And they have talked at length of the sinking feelings of anguish, self-disgust, disappointment and loathing they have experienced when they have come to realize that there was no need to step on that scale to know that every pound of lost weight had found its way back and had even brought along some friends. My experience has taught me that most who wish to lose weight know a good weight loss method. The reason why my workshop does not touch on a diet or exercise program is I am ill-qualified to provide that kind of counsel. Fortunately, that’s not the expertise needed. The central theme of the entire day will focus on what we need to do in our heads, not on what we need to put in our mouths. To this end, I would like to revisit a habit, perhaps more so than any others, that will play a pivotal role in whether we lose weight in the first place, and assuming we do, how successful we are in keeping it off. To be successful anything you must live this: we only ever do one thing, we do what is most important to us in the moment. That simple statement applies to every action we take following every decision we make. We may not always, after the fact, be pleased with our action, but in that moment of action, doing what we did was more important than all the other choices available to us. Here is where you must own your behavior. By way of example, consider working in an office where each person’s birthday is celebrated with a cake of their choice. You have worked diligently at staying within the weight loss method you selected to reach your goal weight. And yet, as that cake – your favourite – is brought into the room, you begin the process of rationalizing why it is okay to indulge in a small piece. You review your recent accomplishments: you have not wavered from the program for eight days; you have lost 4 pounds; you are feeling truly accomplished; you believe you deserve a reward. You convince yourself that by committing to spend an extra hour at the gym tomorrow, it is okay to say yes to a tiny little sliver today. And so you do. And within just a few minutes, the pangs of regret begin gnawing at you. You’re mad at yourself, really angry, and disappointed. But it’s too late. The cake is eaten. And it was a because, in the moment you chose to do so, eating that cake was more important than staying with your program. Putting a piece of that cake in your mouth today was more important than how it will affect you when you step on the scale tomorrow. You have made the most common or four choices. You have chosen to trade what you want (weight loss) for what you want NOW (a piece of cake). You have selected immediate gratification over long-term satisfaction. The Habit of Deciding What’s Truly Important is not only the first step in creating a new you, it is also one of the very few habits we have that left unmastered will stand in the way of us ever getting to where we want to be. Which makes it a habit well worth striving for.